Encouraging women to enter the trades isn't as simple as fitting them with a tool belt. But as the Trades Discovery Program for Women wraps up February 16, program coordinator Julie-Claire Hamilton looks back on a term even more successful than she'd imagined. Hamilton has more than a decade of experience as a journeyperson electrician yet she knows the challenge of breaking into the industry as a woman. At just 18-years-old, recent high school graduate Indie Nelson jumped at the chance to take the 14-week program offered by Selkirk College. “I wanted to see if being a tradesperson was a good fit for me,” she says. Early in the program Nelson and her classmates had the opportunity to try an array of hand and power tools. Though she determined a career in the trades wasn’t for her, she says the Trades Discovery Program has given her a great deal of self-confidence to take with her into the work force. “I will feel a lot more comfortable working with men in any industry,” she says. 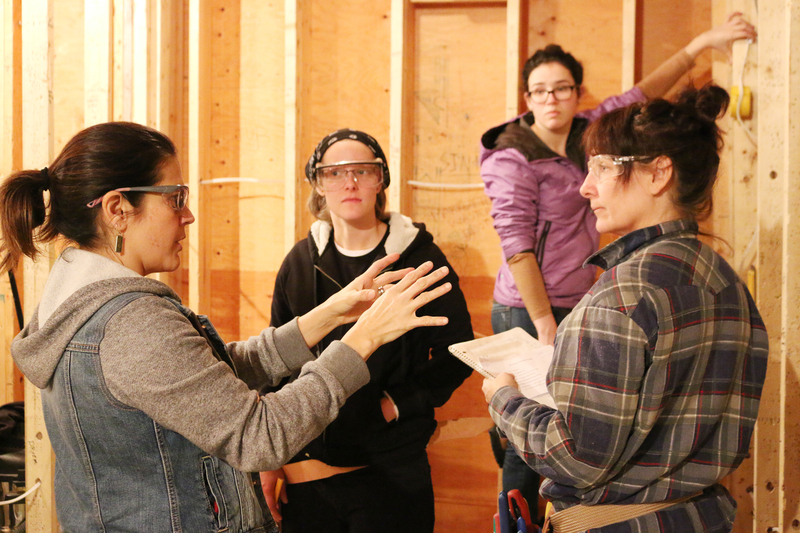 Julie-Claire Hamilton instructs women taking part in the Trades Discovery Program for Women. 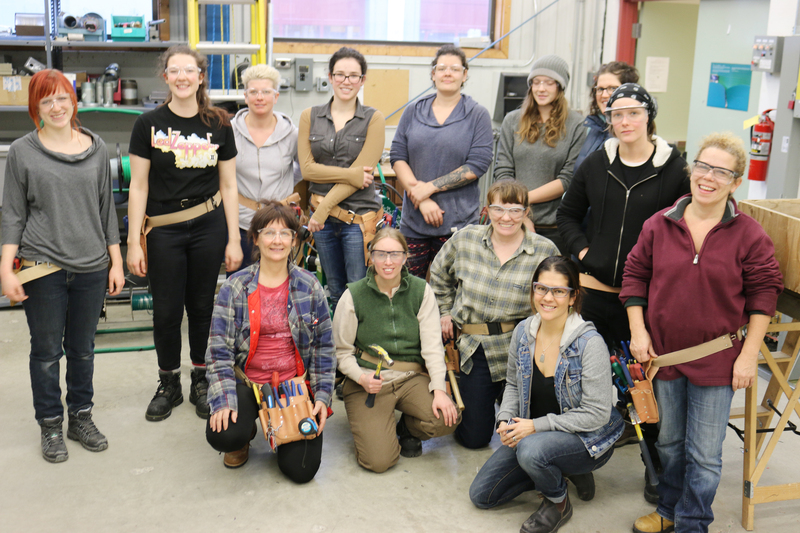 The Trades Discovery Program for Women offered a classroom component at the Greater Trail Community Skills Centre followed by hands-on experience in the shops at Selkirk’s Silver King Campus in Nelson. Funded by the Ministry of Advanced Education, it ran for 14 weeks introducing women to seven different trades. Opening the door for women in trades is all about making them feel confident to enter a field still dominated by men, a field also demanding skilled employees. For many of these students, having work prospects is a huge motivating factor. Hooked at the get go, she credits “world-class” instructors and a well thought out program. The 53-year-old is looking for a new line of work after spending 16 years overseas in the legal profession. Home in the Kootenays, her profession didn’t translate. “And I have always been interested in doing it myself and using my hands,” says Randall. So has Laura Nash, 32. She spent a lot of time in the shop in high school and loved getting her hands dirty. This Selkirk program was a passion rediscovered. The woman recently moved to the Kootenays from Victoria and took the discovery program almost on a whim. The program had her hands on in a greater capacity than she ever expected. Interested in pursuing further studies in welding and metal fabrication, she is hooked. “There is something so satisfying about working with fire, metal melting, sparks. It’s all fun stuff. The bigger the mess, the more I like it,” she says. Academic skills acquired, the women spent the majority of the latter part of the program hands-on building a doghouse and a metal tool box along with wiring the electrical shop, for example. Tickets useful for getting jobs in the trades such as confined space, industrial rigging, fall protection and forklift operations were also taught. The discovery included a valuable two-week job shadow component at Teck, Kalesnikof Lumber, XL Quality Industrial Services Inc., and the ITC Construction Group out of Vancouver which is working on the Nelson Commons project. This gave students the opportunity to check out many different elements of the trades and gain exposure to a variety of worksites and employers. All the students have high praise for Hamilton as a mentor. They admire her skills and the respect she gets in the industry. “She just has such a passion for her line of work. It’s contagious,” says Nash. Two of the 14 women enrolled in the discovery program have already entered into a foundation program at Selkirk College, one in carpentry and the other in metal fabrication. Selkirk College looks forward to offering another Trades Discovery Program for Women next school year with support from the Ministry of Advanced Education. If additional funding is available, they hope to offer a similar program for youth. Learn more about the Trades Discovery Program for Women, browse the photo gallery and join Selkirk College on Facebook.